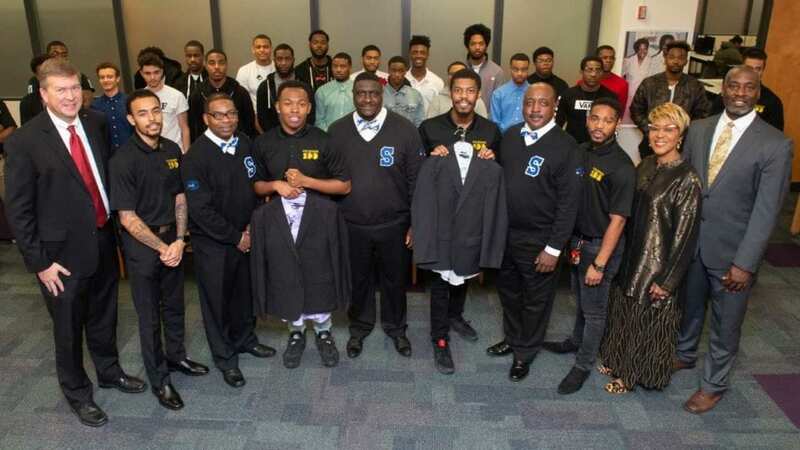 East St. Louis Alumni Chapter of Phi Beta Sigma Fraternity Helps SIUE Students Look Business Ready – 100 Black Men of America, Inc.
More than 100 Southern Illinois University Edwardsville male students were dressed for success thanks to the Phi Beta Sigma Fraternity, Inc. Alumni Chapter Epsilon Lambda Sigma of East St. Louis. Students from SIUE’s Collegiate 100 Chapter and Goal-Oriented African American Men Excel (GAME) received a suit and/or dress shirt on Thursday, Dec. 6 in the Morris University Center’s University Club. The Teamsters National Black Caucus Chapter of St. Louis donated more than 300 business shirts and 31 suits to SIUE students, according to Dr. Freddie Wills, Phi Beta Sigma member.